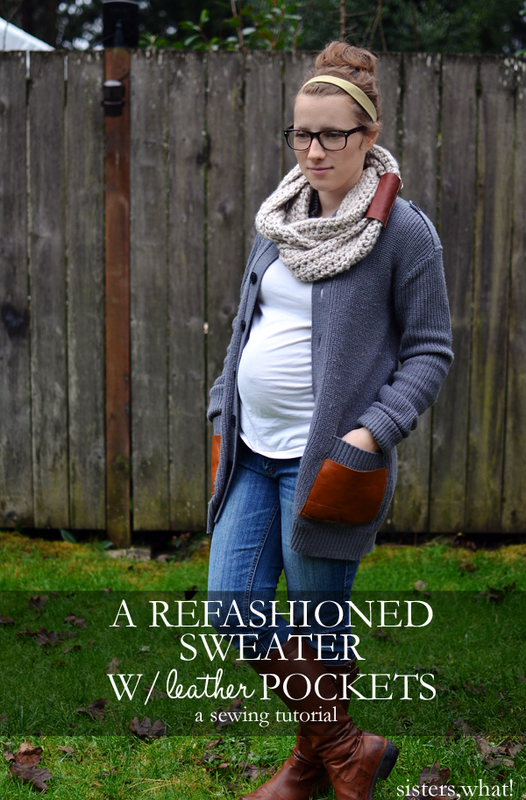 ' A Refashioned Sweater With Leather Pockets - Sisters, What! It's been a while since I've done a refashion, mostly because I'm pregnant and my energy level has dropped and well I don't care as much about what I wear as my belly starts getting largo. 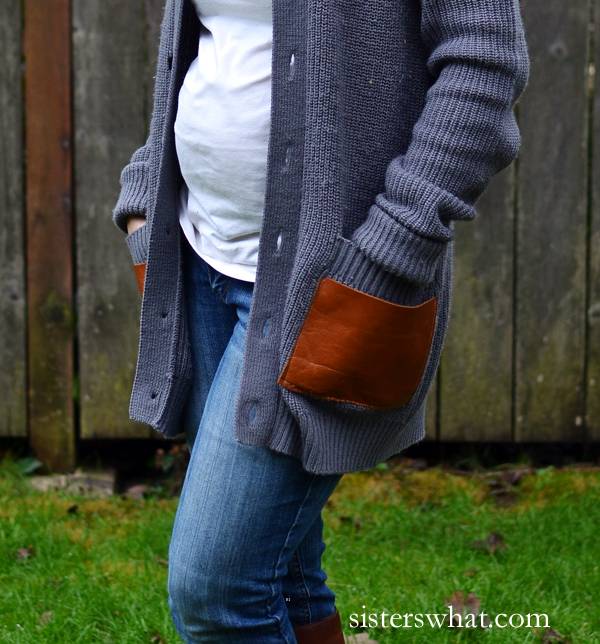 But, it's winter and sweaters are perfect for a winter pregnancy. 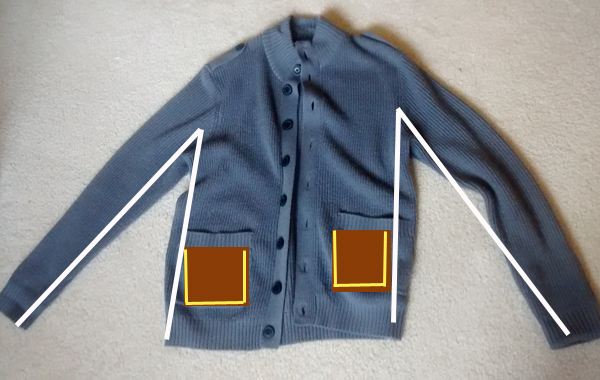 I found this great men's sweater at the thrift store and had a easy refashion in mind just for it: leather pockets. I saw a sweater with leather pockets somewhere and so I thought it might also work for this sweater. When I showed my husband the sweater (before the refashion) he cautiously asked if it was for him. I almost said yes just to make the situation extremely awkward, but he was very relieved to find out it was for me and not for him. Honestly, men's sweaters are perfect to buy from the thrift store. They're usually in good condition and they're big enough that I can take them in to fit me. ||| I laid out a similar sweater on top and loosely took in the arms and the side. I wanted it to fit, but not be too snug. ||| Then I cut leather squares and attached them to the front of the pockets. I wanted the pockets to still be functional, so I only sewed the the side and bottom of the leather squares to the pockets. 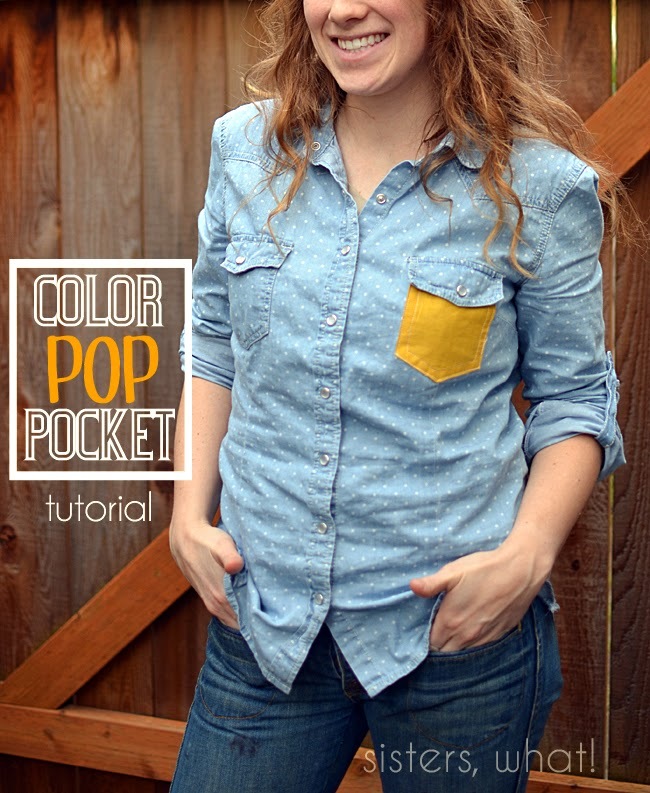 So thus I created extra pockets. And that's it. 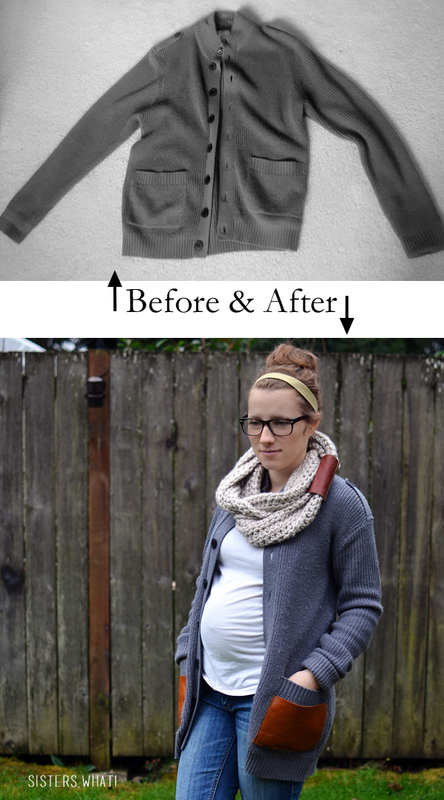 It was ridiculously easy to do and it dresses up the sweater a little bit. not silly, I just sewed the bottom and side of the leather pieces and left the top unsewed. Thus creating a second pocket. The leather pieces are the size of the pockets so I was able to do this. I love it! Where did you find your scarf? I made it, it was really easy, I'll include a tutorial soon. Thank you! I'd love a tutorial! I luhhhhhve it .how cute! I wish I had some clue as how to "take in" sleeves and whatnot. You really look fab! Thank you! 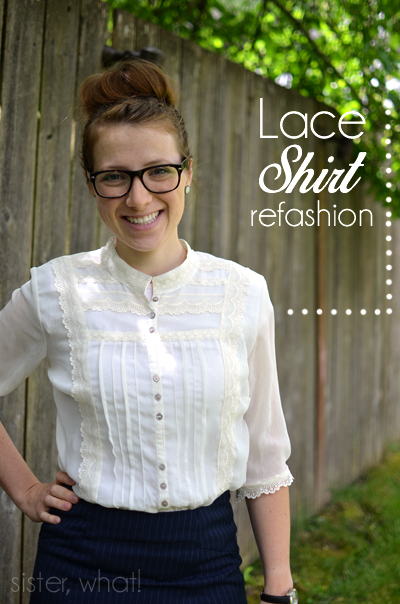 Taking in sleeves is a good, easy sewing project to start with. That sweater looks so warm. Thank you for linking up to Party Time and we hope to see you again next week! Now, I could probably do this... I can sew. 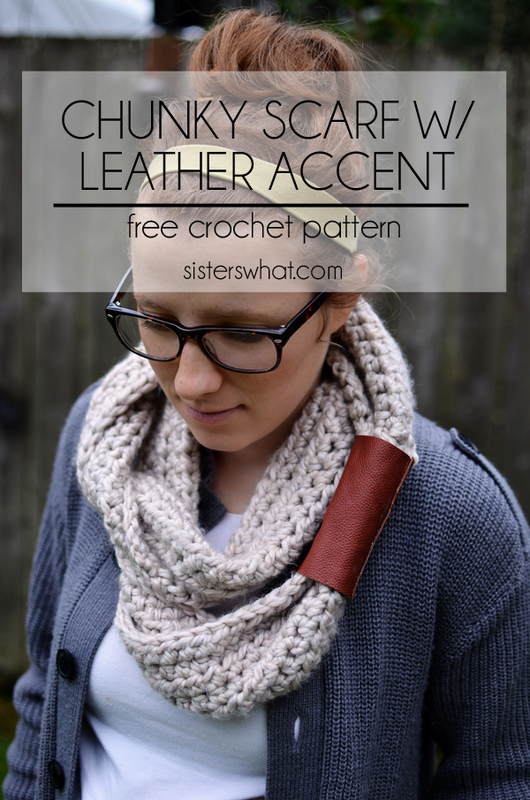 :) Those leather pockets look so cute with your chunky scarf with the leather detail!